5.9L Cummins Engine FanThis fan blade is a Dodge direct replacement unit for all 2003-2008 5.9L & 6.7L Cummins pickups using the 6-Bolt Fan Blade (later trucks use a different fan with a 4-Bolt pattern). If you have a cracked or damaged 6-Bolt fan blade assembly in one of these vehicles, this is the correct replacement part. 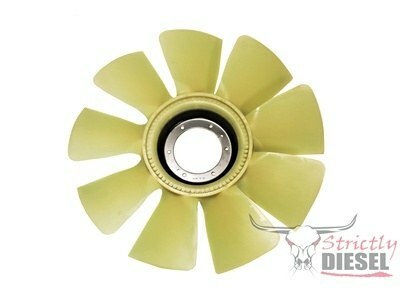 This fan blade is a Dodge direct replacement unit for all 2003-2008 5.9L & 6.7L Cummins pickups using the 6-Bolt Fan Blade (later trucks use a different fan with a 4-Bolt pattern). If you have a cracked or damaged 6-Bolt fan blade assembly in one of these vehicles, this is the correct replacement part. This blade can also be used with the the Cummins Fan Hub Adapter and a mechanical fan clutch to remove the electronic fan clutch from ALL 2003-CURRENT Dodge 5.9L and 6.7L Cummins pickups. Click the Cummins Fan Hub Adapterlink for more details.